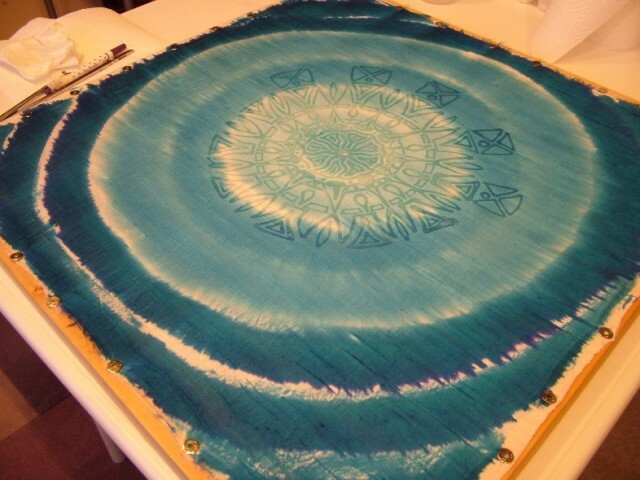 Well, not too long ago I decided to have a break from creating my traditional mandalas on silk using gold resist and dyes. I was open to exploring new directions and giving free flow to my creativity. I began to play with soya wax more and bought myself some tjantings and just literally got going. At the same time I was introduced to the world of fluorescent dyes which was a real delight. However, rather than let my active mind decide how things were going to unfold, I always go into that quiet space within and wait to see what reveals itself and then just start. 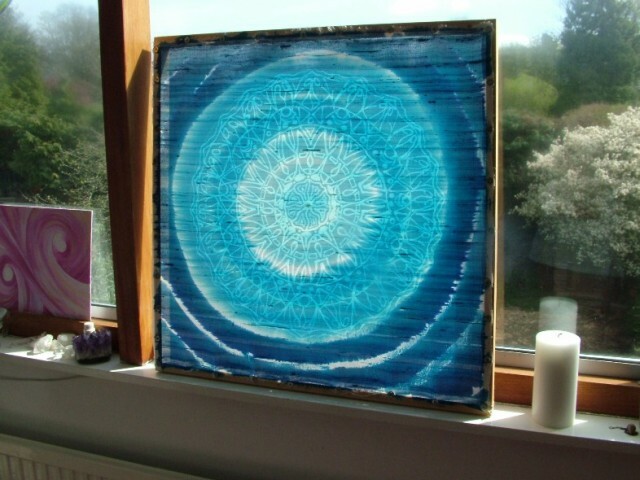 Interestingly you can see that mandalas have emerged from that stillness, but mandalas with a completely new look. I am using soya wax in my tjanting as a resist and at present I have changed over to raw silk, dupioni, which has slubs in it. 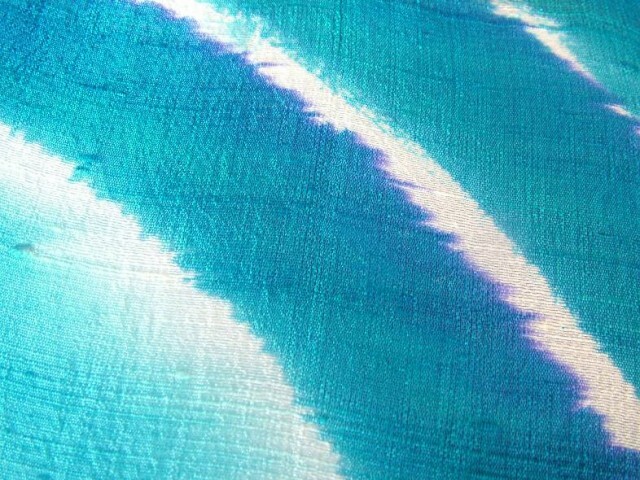 This makes for wonderful texture and the light catches the surface of the fabric in such delightful ways. It comes with new challenges as the surface is not smooth and so I have to slow down and allow the wax to penetrate all the threads in the fabric. 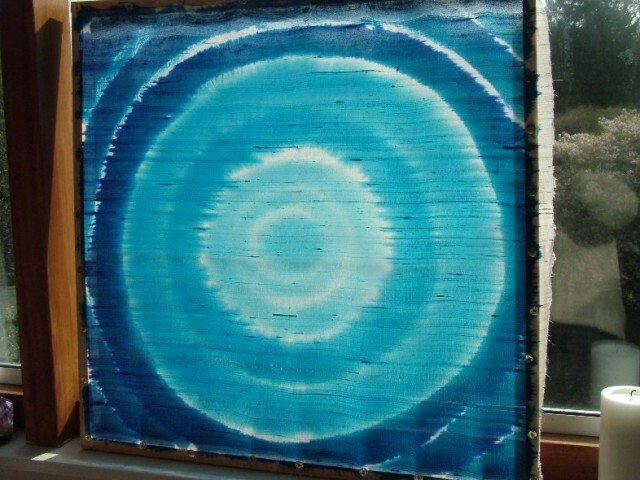 Today I am starting to add dye to the waxed mandala pattern and have been thoroughly enjoying the process. Here are the first few photos documenting my creation. The photos that have turned out the best are those I took in the daylight with the sun’s rays flooding through the window. I’m not surprised at that. 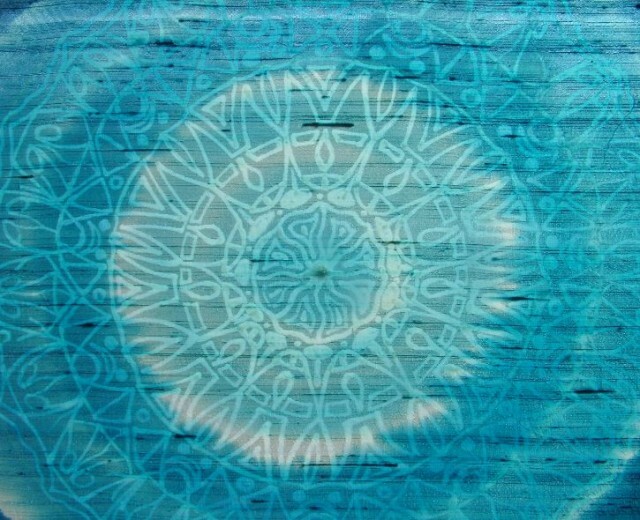 This entry was posted in MANDALA ART, SILK PAINTING and tagged batik, dupioni silk, Fiona Stolze, fionastolze, how to paint on silk, mandalas, mandalas on silk, raw silk, SILK PAINTING, SILK PAINTING TECHNIQUES, silkandart, soya wax, tjanting. Bookmark the permalink.